We get there step by step. Although corny, these words have never been so true. ECLAT has took its time to get to where it is at right now. In between getting legalized, planning our fundraiser and focusing on our next step, there has been a lot of difficult moments. Having gone through them is not an issue, the team believes it is what keeps u stronger and more focused. Some of you witnessed on June 5th how we operate. Our purpose on this day was to be as transparent as possible. Through that, we exposed not only our story, but more importantly our deepest intentions. Although long and a bit unpractical, we appreciated every word that was said, every gesture, every person right down to the last smile what we received. These small moments were the ones who made us believe once more in our cause. ECLAT will bring change, will bring comfort, will bring water to Cotes de Fer, and all of this will be possible thanks to your solidarity and your generous hearts. For us, that was a victory. We had a lower number of attendance when compared to our previous year. Nonetheless, the ones who were here are the ones who mattered. Our donations were $2000 more this year. We were so grateful and humbled by your gesture. ECLAT has never stopped. As we speak, we are in contact with various groups in Haiti. We want to find the best approach in order to start that long awaited water pump. We hear so much that “Haiti se yon teren glise” however we never thought of getting crampons. That is our next step. I invite you to keep #StandingWithECLAT, check our webpage and social media page. The change is near. We are closer than you think. This is not your typical “fluffy” one year celebration. What people expect you to know is all the cheesy, fluffy story about their journey. I could spend the whole day marking our new milestone but I was never known for blowing smoke. Just by the fact that I am right back behind this black desk doing what I think I do best is how bad this topic needs to be addressed. That one word once heard makes us have that jerk reaction to roll our eyes and raise our eyebrows, I wonder if it is because we are irked or bothered about all its red flags and concerns. It is too common to hear “kilè sa ap chanje” when till this day it rhymes too well with “nay”. What is there to say when complain is the main way to stay away. Well for starters a year ago today I, along with five others bothered to focus on the betterment of our homeland and its residents. To be frank we were getting weary of hearing about advances never happening in Haiti. A community so proud of clinging on history, not even capable of providing the bare necessities for its citizenry. ECLAT could not bear with that. It has not gone swimmingly as we have perceived. Not all we hoped stick was a positive hit. This rocky road we decided to follow is plagued by curves and pot holes. Indeed our team is resilient, facing failure and fearing to be unsure. We rely on each other, slowly crawling, but moving forward. We had the pleasure of making our very first Fundraiser. This gesture although not stellar, provided enough cheddar to continue in our endeavor. There were some error but ask whoever and they wouldn’t tell you anything bitter. Artists, families and friends came all to attend and contributed hence. Progress is a slow process, even NY can attest. The renovation of this nation afflicted with limitation lies with the population. Rules and regulations are the personification of irritation without the proper connections. On that note, we follow others as patrons and aspiration to contribute to Haiti’s vaccination. All decision, question and observation has been tossed and turned before being a confirmation. There is no greater sensation than giving our country a better reputation. In a nutshell, we came a long way and believe we are doing well. For my one cheesy sentence: to make an omelette, I believe you can tell. We are in the best positions to start making wells and remove this connotation of “Haiti equals hell”. Help rebuild our country back, be the change, it’s time to act. On the other hand if the answer to that equation is making right impact, what is stopping you from #StandingWithEclat? ​This journey with ÉCLAT has been amazing thus far; we are an inseparable family, united by the same objective that is to shine a positive light on our dear country. We are all passionate about our homeland and we believe in its rich potential. Before discussing about what we have accomplished thus far, let’s talk a little about who we are and how we created our beloved ÉCLAT. I always wanted to give back to my community but never knew how and who to contact. After graduating with my master’s, the subject often rose but I never knew what to do about it. However, I was blessed to be around very ambitious people, precisely Mackendy Talon, our president and my younger sister Sophia Philor who is our Vice-President. Because of these two, I was able to come out of my shell and finally was able to get involved in my community the way I’ve always dreamed of. It all started with Mackendy’s idea to work towards bringing back agriculture in the rural regions of Haiti. Having roots in Côtes-de-Fer (South East of Haiti), we all judged best to start the project there. We spoke about it for weeks, and stayed up all night researching. After having a good idea of what we wanted, Mackendy introduced us to other young professionals who also loved the idea: Widmaier and Didier. These two individuals were amazing from the start and the ideas they brought blew our minds. After just a few days with them, it felt like we knew them for months. Our meetings were always fruitful yet fun. A few weeks later, my youngest sister Anne-Norah Philor, having assisted most of our meetings and who brought up many great ideas, was officially added to the group. We then launched our group online, on every social network in March of 2015. During our first day launching, we received such awesome feedbacks that we could not believe our eyes. What we thought was just a small gesture in our community had so much more impact on others. Our first task was to do a few interviews with the inhabitants of Côtes-de-fer. After our first interview, we were baffled by the fact that we missed what this population needed the most which was water! Without water, they could not work towards agriculture. This discovery brought us back to the drawing board. Our mission slightly took another turn and we drew our focus more into getting funds to help this population with easy access to water. After one trip to Haiti led by our president, it was clear that the inhabitants of Côtes-de-fer are desperately in need of water. They have to walk hours sometimes to fill buckets for their daily use. It is both unfair and inhumane; no one should have to go through this, especially for something as basic as water. This experience opened my eyes. Many of us take these things for granted. We do not think twice when we let the water run in the sink while brushing our teeth or washing dishes. We are stuck in our little bubble and do not realize the ones out there suffering. This is why I am proud of my team and of our objective. 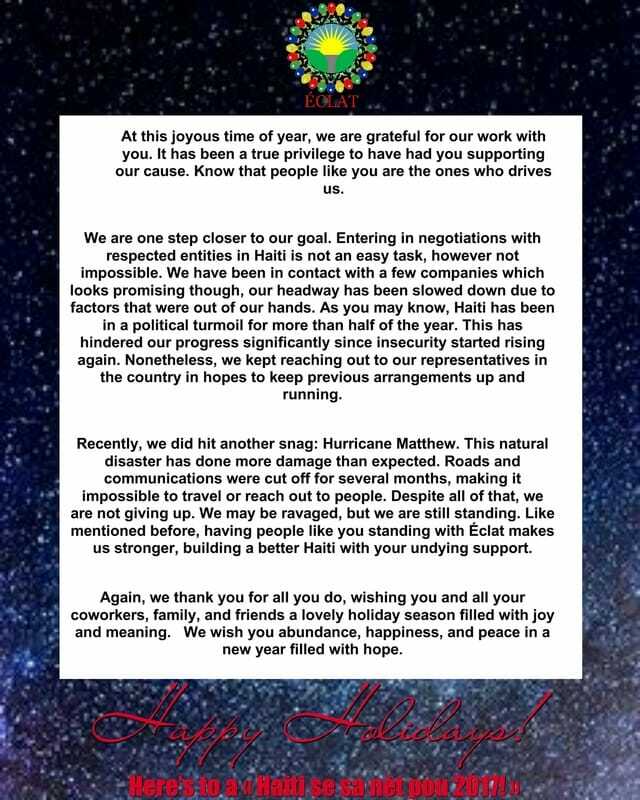 We are dedicated to bring awareness about this issue and therefore help our people in Haiti. This way we believe we could make a change in our country, one rural city at a time. Mackendy Talon, Sophia Philor, Didier Brunot, Clara Philor, Widmaier Janvier, ​Anne-Norah Philor. Experience ECLAT's journey through our eyes, gain first hand insight into our world every step of the way.